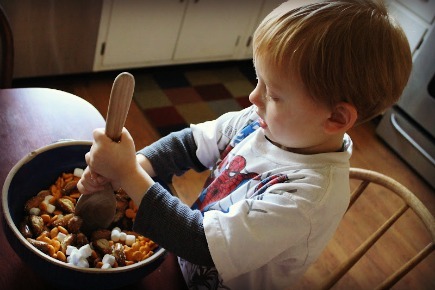 You all know how much I love to spend time in the kitchen…and so do my kids. Unless we are cleaning the kitchen…that’s another story altogether. Out of all my kids Sam seems to enjoy baking with me the most. At least once a week he comes up with an idea of something we “just have to” make. 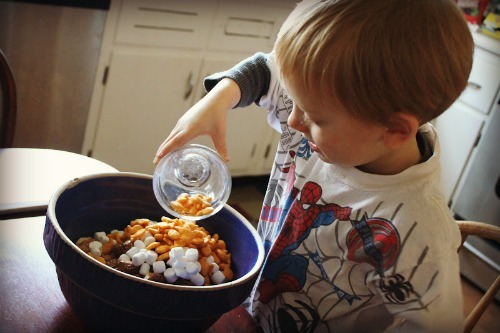 One of his favorite things to make is Trail Mix. Our Trail Mix Recipe is so easy to make, you could probably do it right now, because all you need is some small bits of things that you already have on hand. You can really throw anything you want into Trail Mix. I always make up a big batch when we are going on a long car ride, and pull it out for them to munch on when they start getting squirmy. If it’s a special day I might even add chocolate into the mix, just to make them smile. 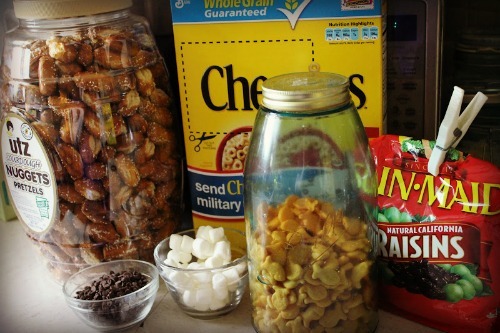 This trail mix recipe is so easy that your kids could make it independently! 1. Collect your ingredients. 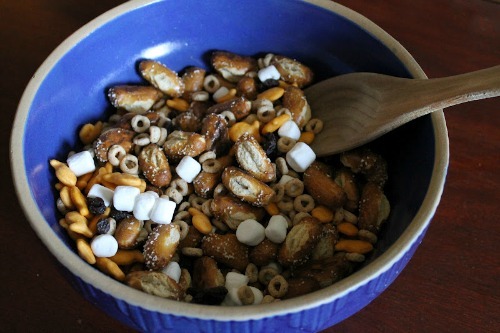 This time we used Cheerios, Pretzels, mini-Chocolate Chips, Marshmallows, Raisins & Goldfish. Seems like an odd assortment of ingredients, but it’s what we had in the pantry, and the kids loved it! 2. Throw all the ingredients into a bowl. Previous postThe First Day of Spring in Cincinnati Next postHats!